Businesses continually strive to find the next big thing that will speak to the ever resistant millennials. It seems our friends in Silicon Valley might have done the leg work for us because instead of creating something new, they chose to enhance an app millions of people use every day; Messenger Apps. Messaging apps are one of the largest mobile services with hundreds of millions of monthly active users. As a result of falling data prices, cheaper devices, and improved features, mobile messaging apps growth is rapidly increasing. The first stage of the chat app revolution was focused on growth (increasing the number of users) and the next phase will be focused on creating services and monetizing the chat apps’ user base. Messaging companies are building out their services to provide more avenues for connecting brands, publishers, and advertisers with their users. For example, Facebook has updated Page Administrators to enable messaging services for their pages. This allows the community of fans to connect with organizations easier and more frequently than with just one on one phone calls. However, it seems the service with the brightest future are the Bots. To gain a better basic understanding of Bots, you should think about the ones you have personally interacted with over the years. Most recently could be Alexa, Amazon’s Echo Device, or Siri, Apple’s bot, who gives you directions, tells you the weather or sets alarms for you. You would probably remember AOL’s SmarterChild back from the 2000’s, who is known for the millions of gained friends on AIM and as that cheeky robot who responded to any question you asked. The new bots are similar to the previous bots in their basic intentions, however the new bots are upgraded to do more and live inside an app people are already using. Messaging bots are a new way to enhance communication across all areas of an organization by clearing up the blurred lines that inevitably happen during customer communications. Still fairly new, bots allow for preprogrammed interactions between a user and a business inside the messenger app. The Bots will have the capacity for intelligence (gained through interactions with its user) to anticipate future needs and will be able to handle a wider range of tasks than previous bots. There are three main players in the Bot Space right now; Facebook Messenger, Microsoft, and Kik. The three platforms each have pros and cons, as shown in the chart below. Facebook Messenger has the ability to conveniently connect people with their favorite organizations in an app over 900M people have. These Bots are still in beta and are being tested with certain businesses. When the services become available it will be an extremely high volume area with businesses and advertisers alike competing to create the most used Bot. 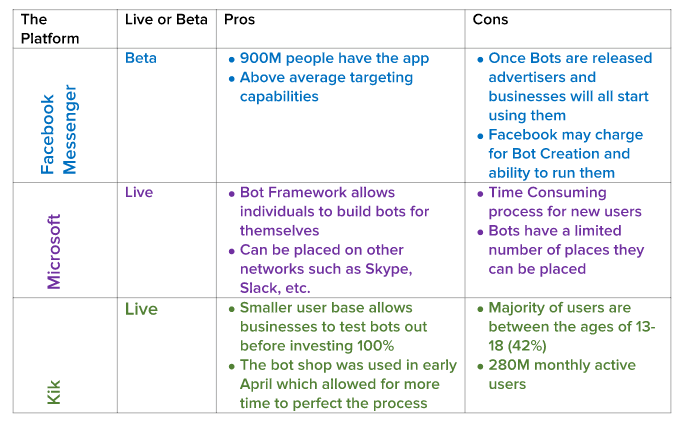 Microsoft created the “Bot Framework” for people to create Bots that interact with users on different platforms such as Slack, Skype, and more. Individuals build these bots themselves and program them to do what they wish. While a Microsoft Bot can be used on different platforms, it is a time consuming process for a not completely developed idea. Of all the Messenger Bots we reviewed, Kik’s Bot Shop seems like the strongest option among its competitors. While their scale is currently low, Kik allows users to develop their own Smart Bot to interact with users on the platform. They offer a low cost buy in, open market, and growth opportunity. Their key demo is 13-18 so if your brand falls into that demographic then this could be a solid partnership. We recommend waiting to invest heavily in bots until a messenger app creates one more mature for the market to use. Messenger Apps are a force to be reckoned with. The convenience, low cost, and immense growth since their creation has been exponential. Messenger Bots are the next phase in the development of Messenger Apps and even though the products are not finished, the world is excited to see them.